“Infinite Grass” – Greetings from the top of the Everglades .. AwakentheGrass ART! Aerial view from mid-air, on the “Jetsons” observation tower in Shark Valley, Everglades. The idea behind this little adventure was to scout out the photographic possibilities of hiking out into the Shark River Slough of the Everglades by starting at the Shark Valley “Jetsons” Observation Tower. The well known “Tram Road” as the Park calls it, juts out about 7 miles along the edge of the Shark River Slough better known as the “River of Grass“. So I wanted to see what conditions would be like for hiking at the end of our dry season when water levels in the Everglades are at their lowest. 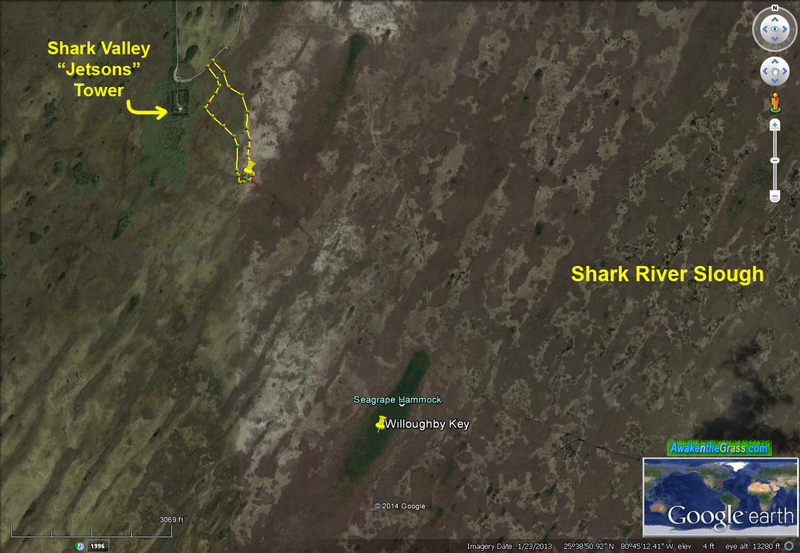 Satellite view of Shark Valley and Seagrape Hammock on the Shark River Slough. 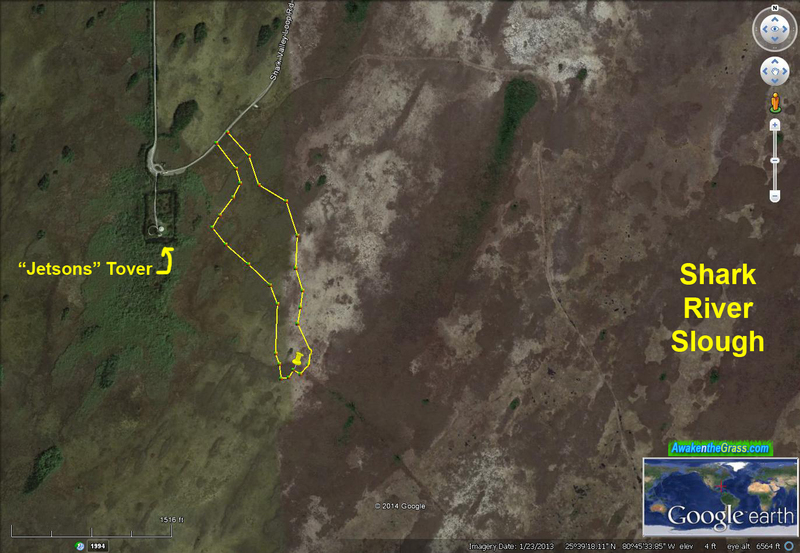 Approximate path hiked out towards a “ridge” and back, southeast of the Shark Valley tower in the Everglades. Ready to pedal out to the tower! Welcome to the “Jetsons” tower, as I like to call it. Gaging station EDEN G-620 at the base of the tower. Joining me on this adventure was David Warfel, an avid hiker and explorer. He had called the Park to inquire about drinking water at the tower and was told there was a water fountain. As far as I knew, there used to be one there, but it was removed several years ago for some reason. Good thing I brought extra water (6 liters) as David was counting on filling up at the tower! Also, right under the tower base is a water gaging station EDEN G-620, data from which can be useful to estimate water levels at the edge of the slough here. There USED to be a water fountain here. Note there is NO POTABLE WATER at the tower at all, despite what the Park staff may tell you!! Ramp leading up to the Shark Valley observation tower. Note to self: Next time use only hard shell containers for drinking water. I brought a full 6 liter water pouch (covered with black fabric). While we were up on the tower, the clever crows found this shape interesting and pecked and pecked into it until several leaks sprung!! Luckily David had his backpack bladder empty, so we saved most of the precious water. Oh what teamwork! High above the Everglades, inside the top level turret of the Shark Valley observation tower. Looks like someone else had recently tagged (graffiti) the staircase. Setting up for some aerial photography from the top of the Everglades. We decided to survey the lay of the land (or grass in this case) from the tower. The observation deck at the tower is actually only the lowest of three levels linked by a spiral staircase. Normally there are metal plates blocking access to the upper levels of the tower, but on this day it was wide open and afforded the opportunity to get nearly twice as high – above the slough for an even more incredible view! Extreme-telephoto view of the Tram Road in Shark Valley, Everglades. The Shark River Slough presents a seemingly endless realm of water and grass punctuated only by hammock islands of various shapes and sizes. Many of the larger ones were used in the past by Native American tribes, and later by Gladesmen as hunting camps, etc. From this elevated view, the “River of Grass” really starts to make sense! An interesting fact is that even though most of the hammocks are really just clumps of vegetation with maybe a little bit of actual soil, they are all unique. Each can have a distinct shape and a “profile” which can last for many decades. Panorama 360 from the very top of the Shark Valley observation tower! CLICK for interactive panoramic – try it on your iPhone. One of these hammock islands called Seagrape Hammock, is less than two miles directly southeast of the tower. It is the site of “Willoughby Key”, as christened by the explorer H.L. Willoughby during his 1898 expedition in the Everglades. He wrote an entertaining account of his travels in a book “Across the Everglades” – a good read (download a free electronic version). Willoughby noted after climbing a tall tree on this hammock and observing with a telescope that he must be in the east-west center of the Everglades slough, and he wasn’t too far off. The wrap around view from the tower is the equivalent these days, as you can see the whole width of the slough for yourself. In the dry season, this hammock might be accessible by foot – in theory at least! Telephoto close up of Seagrape Hammock aka “Willoughby Key”, less than two miles to the southeast. During a kayak trip down the slough (Kayaking the River of Grass – a Shark River Slough Expedition), I paddled within less than a mile of the other side of the hammock, but time constraints didn’t permit us to check it out. Access by kayak or canoe is only possible at the other extreme of our South Florida weather cycle – the end of the wet season, usually sometime in November. Paddling out there would make a long day trip as the nearest access point is the L-67 extension canal to the east. Perhaps in time the Park service can be persuaded to allow the Shark Valley Tram concessionaire to shuttle canoes/kayaks for launching at the airboat ramp next to the tower. This could really open up a whole new world of possibilities for backcountry grass paddling and exploration of the upper reaches of Everglades National Park!! Seagrape Hammock, aka “Wiloughby Key” as seen from a kayak less than a mile away. The Shark Valley “Jetsons” tower about 3 miles away as seen from a kayak on the Shark River Slough. If you’d like you can skip ahead to Part II where me and David used a combined pedal and paddle approach to successfully reach and explore Seagrape Hammock! Pedal and Paddle in Shark Valley: The kayak and the wheel, a symbiotic relationship! Future launching at the tower could also enable runs straight down the Shark River Slough to the Canepatch backcountry campsite. Even more fun would be a crossing of the slough, straight down due south to the Pahayokee overlook which juts out into the slough from the east side. You can read about a recent attempt at paddling a part of that route in: Pahayokee to Main Street – probing into the Shark River Slough . This is what “paddling” on the slough looks like when there isn’t enough water! You can see the inherent dilemma of Shark River Slough exploration. On the one hand you can go paddling and hope for higher water levels, or on the other, try hiking and pray for really low water. The slough is that special kind of place that is too shallow for boats and too deep for walking! This is why airboats were developed and why they are the preferred mode of travel over the Everglades River of Grass! It is also why strategically placed access points are key to successful and safe slough exploration and “Grass Paddling”. Read about a recent Grass Paddling event inside the East Everglades Expansion Area in: Grass Paddling in the East Everglades Expansion Area – History,Gladesmen & more Grass! View of the “Jetsons” tower from the other side! The terrain helps explain how Native Americans were able to remain hidden and inaccessible in South Florida’s Terra Incognita for so long. It wasn’t until in 1840, some 300 years after the “discovery” of Florida, that Lt Col Harney became the first white man to penetrate into the interior of the Everglades. He did it by adopting native ways, strategies and canoes, along with a slave guide to show him the way through the vast sawgrass expanses! Back then there were only “water leads” which connected much of the ‘Glades interior to creeks and streams leading out to the coastline. Today most of these are lost to history, but there are plenty of water leads in the form of airboat trails. For better or worse, the Park only tolerates limited public airboat use in the East Everglades Expansion Area. This means that many airboat trails will become overgrown and impassable without the boats keeping them open, and this is bad news for backcountry grass paddlers too. If you think walking through sawgrass is tough, try paddling into it! There is currently a great opportunity for Everglades National Park to establish a paddling network utilizing already existing airboat trails and access points (ramps) off Tamiami Trail (Hwy 41), Shark Valley and Chekika day use area into the great Shark River Slough!! Stepping into the slough and the tall sawgrass. We decided to try a shortcut starting just east of the tower, and headed out in a general SE direction. There is a clear airboat trail as can be seen in satellite images on Google Earth that leads directly to the northern tip of Seagrape Hammock. We never did meet up with the trail, as the sawgrass patches are thick and tough to get through on foot. Walking through sawgrass means high stepping the whole way! Hiking off trail is always more strenuous, and even more so in the slough. The shallow sections are at least ankle deep and often conceal limestone rocks and solution holes. The sawgrass is ok until it starts to get above 4 or 5 feet high. In general once past head high, progress becomes very slow and tedious. Sawgrass is SHARP! Sharp as a razor!! However it only cuts if you happen to slide against it lengthwise along the blade (shaft). Walking perpendicularly into it usually presents no problem, and neither one of us got any cuts. Long sleeve clothing, pants, shades, face covering and a hat helped a lot. Gloves would’ve been great too had I not left them on the bumper of my truck. The beautiful wide expanses of the slough. In the afternoon, the (dry) slough glows with a beautiful golden hue that compliments the big blue sky! Caught in the act of pole aerial photography in the Everglades! BIG thanks to David Warfel of the FTA for some great pics of me in photographic action! One result is the aerial panorama below! Panoramic bird’s eye view of the River of Grass – the Shark River Slough. The slough isn’t really a place for people to get around on foot..
however it is great for some aerial landscape photography!! Flex Kayakfari – a selfie in the tall sawgrass. The sawgrass quickly becomes overhead high, and really tough to get through. In the sawgrass that easily grows 8 – 10 feet high! In these pictures you can see why people just don’t go hiking into the sawgrass prairies. There is a need for trails and a way of keeping them open. One way to do this would be to open up access points as previously mentioned and invite paddlers to use them well in the wet season! Off-trail, in the thick of it – the sawgrass patches! Note Seagrape Hammock directly behind us on the horizon in this aerial view. Above you can make out the “ridge” that we are standing in front of. It continues southeast towards Seagrape Hammock. However this is also where some of the tallest sawgrass patches grow. Often we’d come across “water leads” maybe up to two feet wide leading towards small tree islands, but never did see any critters! A “water lead” probably cleared and maintained by alligators. It leads directly to the small tree island surrounded by a thick sawgrass patch! Under the canopy, Inside the above tree island looks to be a possible den. Checking Google Earth, charting out a path to avoid the sawgrass as much as possible! The Shark Valley tower rising up from the River of Grass. Bladderwort, a kind of carnivorous plant grows widespread over the “meadows” in the slough. I captured some unique aerial perspectives of Shark Valley as in the panorama below..
A 360 aerial panorama on the Shark River Slough in the golden late afternoon! You can read more about my pole aerial photography techniques in: A Kayak Aerial Photography Method – a behind (and above) the scenes look! Later afternoon over Shark River Slough. It’s good to see Periphyton growing like this! It means that the water is pretty clean here. Beds of Periphyton floating east of the Shark Valley tower in the Everglades. This turned out to be a fairly short and demanding hike, yet one that produced some real photographic gems! Looking forward to further exploration of the River of Grass. The big ball of fire sets over the Shark River Slough under an orange blaze sky! © 2014 Flex Maslan / Awakenthegrass.com / kayakfari.com / digital029art.com. All original photographs, artworks and music in this portfolio are copyrighted and owned by the artist, Flex Maslan, unless otherwise noted. Any reproduction, modification, publication, transmission, transfer, or exploitation of any of the content, for personal or commercial use, whether in whole or in part, without written permission from the artist is strictly prohibited.